We all have them. And whether they are big or small, those goals can often lurk in the back of our brains and live there, unfulfilled. The thing is, we tend to push our goals to the end of a very long and never-ending to-do list. After juggling deadlines, work, health, and family, most of our time and energy is zapped by the end of the day. Where do you even find the time to go after the bigger picture stuff? And, what do you do when you actually want to start crushing your goals? For starters, you need a plan! You see, the only way to accomplish and even crush your goals is to get organized. This means taking big goals and breaking them down into smaller actionable steps and breaking those steps into even smaller daily to-dos. These little to-dos will fit effortlessly into your daily life and only take up a small amount of time. You see, almost any goal is achievable when broken down into small tasks that you can check off each day. What’s more, achieving your goals shouldn’t be the hard part. With a little determination, organization, and planning, you’ll be amazed at how much you can accomplish towards your goals each and every week. 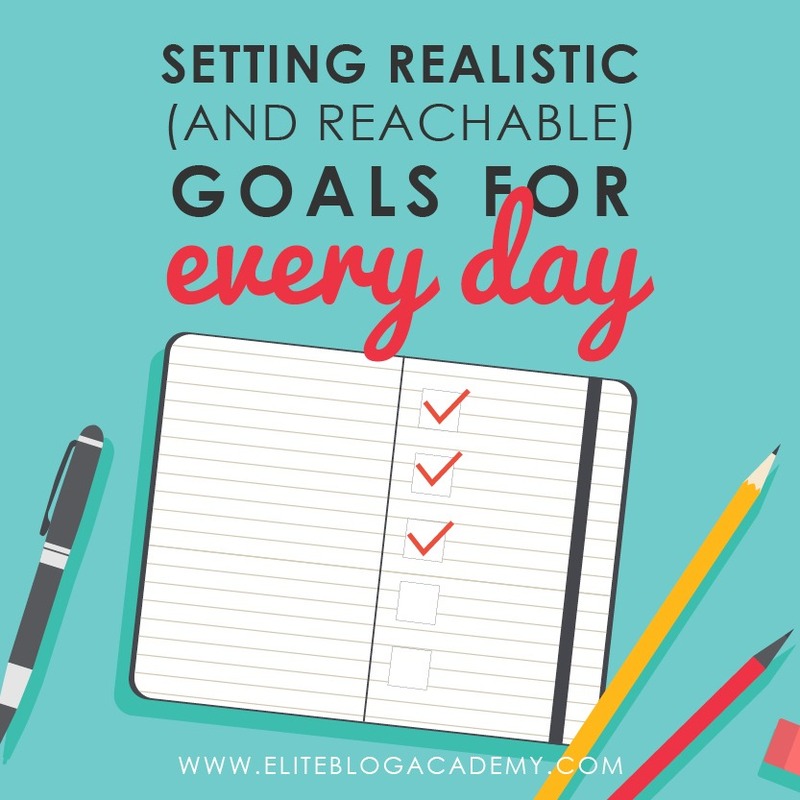 So, we know we need to have a plan, but how do you actually go about setting realistic and reachable goals each day? Below are three easy to follow steps that will help you get that much closer to crushing it. In order to get started setting daily goals, you will first need to define your big goal! This is the one that’s been in the back of your mind, the extra-large, don’t know if I can ever do it, type of goal. What’s the use in setting a goal that’s small? You want this goal to give you a huge sense of accomplishment when complete. And, you want this goal to scare you a little bit. Once you have identified that BIG goal, now it’s time to get into the detail phase. Since this is a big goal, make sure your timeline is big to match, but also make sure to challenge yourself a bit. Whether it’s 6 months from now, a year, or 3 years, it is up to you. Now the accountability piece. You need to break that big goal down into smaller monthly goals. If you’re creating a 12-part course, let’s say you give yourself a year to complete. Well, each month your goal should be to complete one section of the course. This way you will be held accountable for your smaller goals while getting you closer to crushing your biggest goal. This is where your organization skills are going to be called upon. Once you have a deadline for your large goal and your monthly goals are mapped out, you need to start breaking those monthly goals into weekly goals and then those weekly goals into daily to-do’s. In the end, you’ll have a set of daily tasks that feel doable. Completing these small tasks will give you a sense of accomplishment and the satisfaction of being one step closer to your big goal. The Living Well Planner® is the perfect tool to help you break down your big goals into actionable daily tasks. I also start each week off by using my Weekly Wizard™ sticky notes. This page helps me identify ONE big thing that is most important this week. I like to call it the big focus. It also helps me identify my top three tasks, starting with the “A” tasks, or the ones that absolutely must get done this week to get me closer to my goals. Once you’ve filled out your Weekly Wizard™, block out time on your schedule to make it happen. This is a process of making an appointment or meeting with yourself. Take this time as seriously as you would any other appointment. It is your focus time to complete your “big goal” task for that day. Simple enough, right? It just takes some dedication and determination on your part but breaking down your goals into measurable chunks take the scary/overwhelming factors out of the equation.